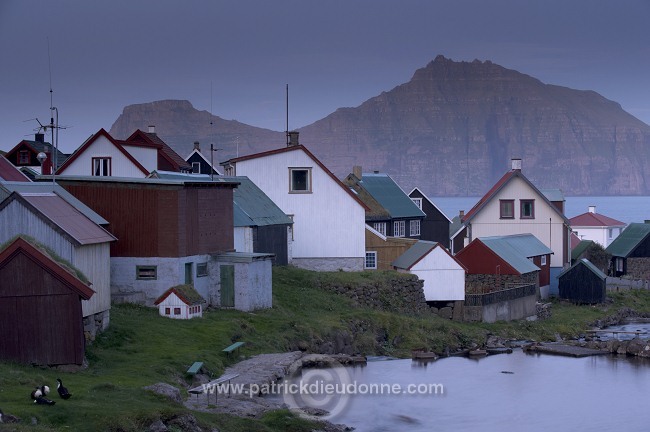 Description: Houses at Gjogv at twilight, with view on Kalsoy cliffs (Nestindar, 788m, Borgarin, 537m), Eysturoy, Faroe islands (Faroes), Denmark, Europe, Europe - Maisons a Gjogv au crepuscule, falaises de Kalsoy au loin, Eysturoy, iles Feroe (Feroes), Danemark, Europe - Format: digital, Nikon D3 full-frame professional DSLR - 58 Mo tif files. - - Format: digital, Nikon D3 full-frame professional DSLR - 58 Mo tif files. Caption Houses at Gjogv at twilight, with view on Kalsoy cliffs (Nestindar, 788m, Borgarin, 537m), Eysturoy, Faroe islands (Faroes), Denmark, Europe, Europe - Maisons a Gjogv au crepuscule, falaises de Kalsoy au loin, Eysturoy, iles Feroe (Feroes), Danemark, Europe - Format: digital, Nikon D3 full-frame professional DSLR - 58 Mo tif files. - - Format: digital, Nikon D3 full-frame professional DSLR - 58 Mo tif files.